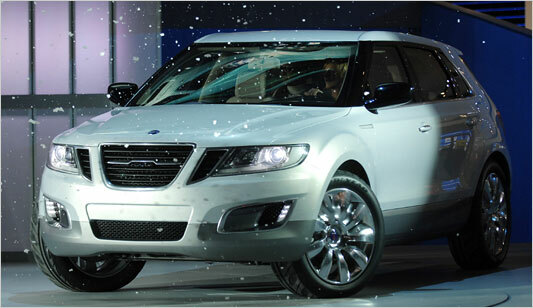 The Saab 9-4X is a mid-size crossover SUV introduced by Swedish automaker Saab Automobile at the LA Auto Show 2010. It is based on the all-wheel drive GM Theta Premium platform. The 9-4X will begin production in 2011 and is scheduled to be built at Ramos Arizpe, Mexico. The main challenge, according to Svante Kinell at the marketing department at Saab, is to find the right Diesel engines for the European market. As a result, the vehicle is V6-only. The focus of the 9-4X took shape once the Saab 9-6X project was cancelled, after the divestment by General Motors of its holding in Subaru. The 9-4X will replace the larger U.S. built Saab 9-7X SUV, production of which ceased in December 2008. The 9-4X concept made its debut at the 2008 North American International Auto Show. The Saab 9-4x crossover has entered production at General Motors’ Ramos Arizpe, Mexico plant. Per the report, 147 examples of the 9-4x were produced, 49 of which occurred the week of January 23, 2010. The car will be released at the 2010 LA Auto Show as a 2012 model year vehicle. The production car will be almost identical to the concept on the exterior and be similar to the 2010 Saab 9-5 on the inside. The car is slated to be start selling as a 2012 model year vehicle in May in the US and in August elsewhere.